North Korea's first satellite Kwangmyongsong 3-2 (KMS 3-2) cannot be seen from the northern hemisphere at the moment (and hence cannot be observed by me currently). 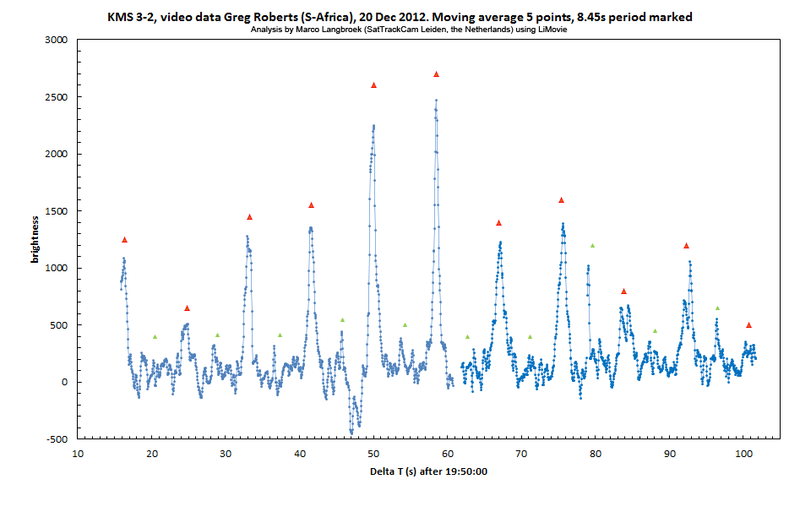 On the southern hemisphere, Greg Roberts (CoSatTrak) in South Africa is however successfully tracking the satellite. The satellite is the object near the center of the screen, flashing about each 8.5 seconds with periods of invisibility inbetween. The moving streaks are stars (the mount is tracking the satellite as it moved along the sky): the other stationary dots in the image are hot pixels on the sensor of the video camera. Visible is a clear ~8.45s periodicity with flashes of a specular character (suggesting a flat reflective surface). I have marked this with red triangles 8.45 seconds apart. In between the main flashes, a pattern of smaller secondary flashes can be discerned in a semi 8.45 second peridicity too (green triangles). They are not exactly positioned halfway between major flashes. Assuming that each major flash is a flash caused by one of the sides of the KMS 3-2 cube-shaped body, then it completes a tumble once every ~33.8 seconds. Assuming that the less clear secondary flashes are due to a side of the cube as well, the tumbling periodicity would be half of that, i.e. 16.9 seconds. What can be seen, is a flashing behaviour that starts slow and gentle and is increasing in rapidity near the end of the analysis, this being an effect of changing viewing angle. Contrary to what some alarmist (sometimes almost hysterical) media reports have suggested, the tumbling of KMS 3-2 is by no means dangerous. David Wright over at All Things Nuclear has a very good debunking story about this all, pointing out the many misconceptions rampant in the reporting. [UPDATED] A post-analysis of the N-Korean launch window, and N-Korean Spooks on my weblog? On December 12, North Korea surprised the Western world by successfully bringing its first independently confirmed satellite into orbit: Kwangmyongsong 3-2, a reportedly 100 kg cubesat. For images of the satellite and an analysis of its likely components, see here. The satellite was launched with an UNHA 3 rocket from Sohae Launch Centre in Cholsan. The successful launch came as a surprise for two reasons. First, all previous North Korean satellite launch attempts abysmally failed (even if N-Korea claimed they were a success). Second, North Korea had indicated days before the launch that the launch was to be postponed to late December, for technical reasons. This appears to have been a deliberate disinformation ploy by N-Korea. According to South Korean press sources, it appears they also tried to play a ruse on the Americans, by pretending to dismantle the rocket when US imaging satellites were overhead, and continuing launch preparations when they were not. Well then: did the North Koreans indeed try to evade US (and Japanese) satellite surveillance? First, they would not have been able to evade detection of the launch itself by US infra-red early warning satellites such as the DSP satellites and SBIRS in geostationary and HEO orbit. Coverage by these satellites is continuous. But that was probably not N-Korea's goal anyway. Their goal reportedly was to try to convince analysts of imagery from US imaging satellites (optical and radar) that the rocket was not yet complete at the launch site, and not yet ready to launch for a while. The aim was apparently to throw off US predictions about the "when" of the launch until the very moment of launch itself. Their concern hence was with US and Japanese optical and radar imaging satellites such as the KH-12 Keyholes, Lacrosses, FIA and IGS. These imaging satellites move in LEO, and coverage is not continuous- not yet at least. Indeed, the timing of the North Korean launch (00:49 UTC on December 12) is interesting. It coincides with the end of a one hour long interval with no coverage of the launch site by US or Japanese Low Earth Orbit imaging satellites. By contrast, in the hours prior to and after this one-hour gap in coverage, such periods of non-coverage were much shorter (typically 10-15 minutes at best), as can be seen in the coverage analysis images below and the movie near the top of this post (movie, images and analysis made using JSatTrak). As can be seen from the coverage analysis, this hour long interval between 23:45-00:45 UT really stands out compared to the hours before and after. The N-Koreans launched right at the end of this interval at 00:49 UT, just when the launch site was coming into reach of the FIA Radar 2. I feel the launch right at the end of this interval is no coincidence: they picked a moment where prior to launch they would have a substantial gap in US satellite surveillance available to complete their launch preparations. The one-hour long interval seems to have provided the North Koreans enough time to remount whatever they dismounted or camouflaged as a ruse, and launch. 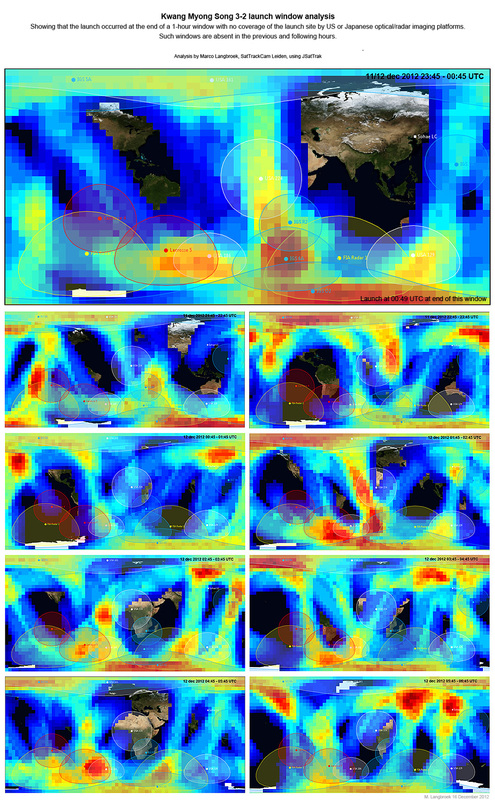 (some remarks on the analysis and movie above: for a few of the satellites shown, positions are not 100% certain. For example, the Keyhole USA 186 hasn't been observed for a while because of the midwinter blackout. Satellites included in the analysis are the Japanese IGS, the US Keyholes, Lacrosses and FIA [edit: plus SPOT, Worldview and Quickbird commercial imaging satellites]). I initially forgot to include the GeoEye Worldview and Quickbird commercial imaging satellites in the analysis. These commercial sats are frequently hired by the US government for selected imaging and used by independent analysts as well. Also added the French SPOT satellites to the analysis. 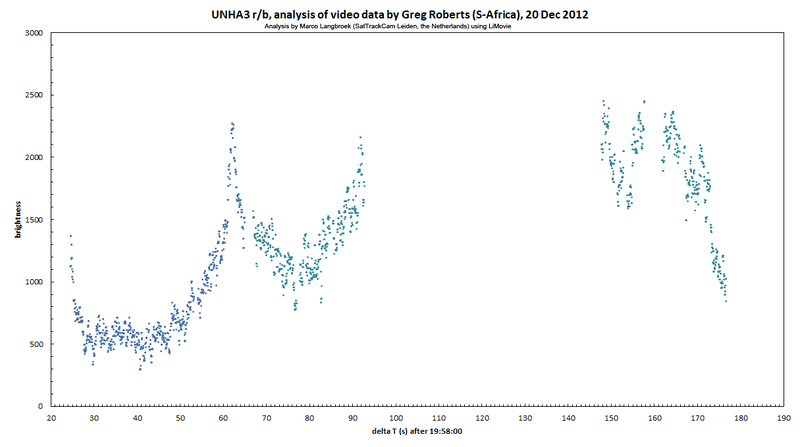 Again, the 1-hour coverage gap between 11 Dec 23:45 and 12 dec 00:45 UT keeps standing. 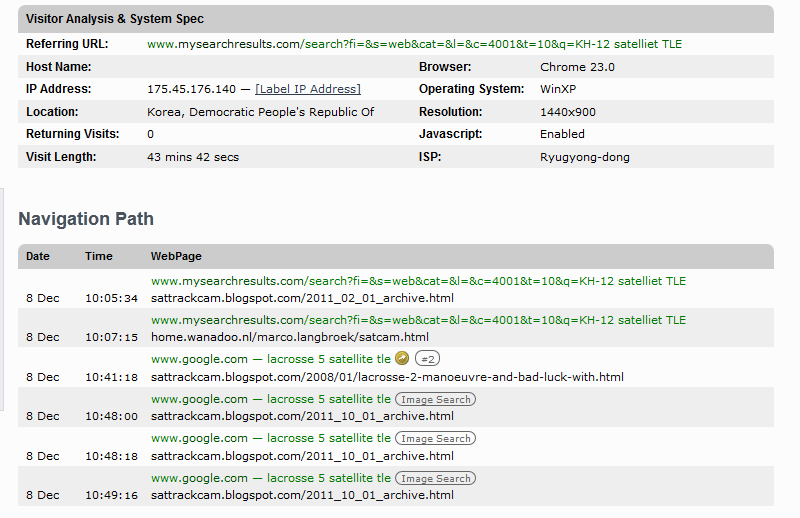 Korean Spooks on my weblog? North Koreans with access to international websites are about as rare as, well, North Korean unicorns. Only a very select handful of North Koreans -mostly direct family members of Kim Jong Un- are allowed access to the internet. Disclaimer: I was (and am) slightly suspicious. IP's can be spoofed, and two things caught my eye. One is the OS listed, Windows Xp. N-Korea is supposed to have its own OS, 'Red Star'. But then, maybe they only use this for their own, completely internal version of the internet. Or maybe western webstatistics providers cannot properly recognize it and list it as Xp (plus it could be a knock-off of Xp, even). Second initially suspicious detail: the 10:05 and 10:07 visits have the word "satelliet", not "satellite" in the search string. That raised some suspicion as "satelliet" is the Dutch word for "satellite". However: that could also be a simple typo (switching the last two characters - a very common kind of typo) instead of a Dutchman typing. Assuming that this was a real N-Korean visit, then the visit is highly interesting with reference to the apparent ruse played on US satellite surveillance of N-Korea as analysed above. For here we apparently have a North Korean, a country where the average Kim is not allowed access to the internet, looking for orbital information on US surveillance satellites on my weblog! This moreover was someone with at least some knowledge of satellites - again, not your average North Korean Kim, but suggestive of someone from the NK space program or intelligence program. The specific keywords 'tle' (two-line elements, i.e. a set of satellite orbital elements) and 'Lacrosse 5' (a US radar imaging satellite) and 'KH-12' (US Keyhole-12/Advanced Crystal optical imaging satellites, i.e. the satellites USA 129, USA 161, USA 186 and USA 224) bear this out. Yet this person wasn't perhaps entirely informed. He or she searched for orbital information on those US optical and radar imaging satellites that form the backbone of US space-based surveillance, but notably missing from the search queries is the most recent addition to the US radar surveillance constellation, the two FIA Radar satellites. Also missing are Japan's IGS satellites. But, maybe, after checking for the KH-12 and Lacrosse 5 they realized they should not be on my blog for this information - they should be at Mike's website for that.